Follow the trail into the Old Norwichtown Cemetery, and cross the bridge to the left. 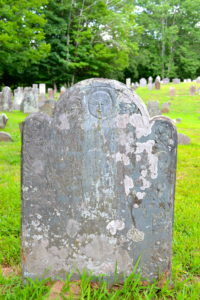 Head uphill to find a modern plaque atop a black metal stanchion, designating the grave of Hannah Waterman King Arnold, the mother of Benedict Arnold. Shortly after Hannah and Benedict III were married, market downturns caused hardships in the family finances. Compounded by the early deaths of their children, Mr. Arnold (III) descended into alcoholism and depression. After years of heartbreak, and grieving from family disruptions and untimely deaths, Hannah Arnold died on August 15, 1758, and her husband, Benedict III died in 1761. 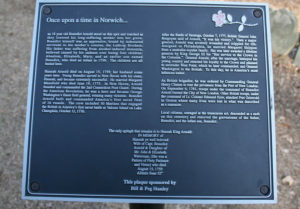 They were both interred in the Old Norwichtown Burial Ground. Mercifully, she did not live to see her once-lauded son, Major General Benedict Arnold (V), betray the cause of American independence in 1781. In September of that year, then-British Brigadier General Benedict Arnold commanded Crown forces as they attacked and burned New London. Across the Thames River in Groton, after the patriot defenders at Fort Griswold surrendered, British soldiers conducted a horrendous massacre of over 90 men. 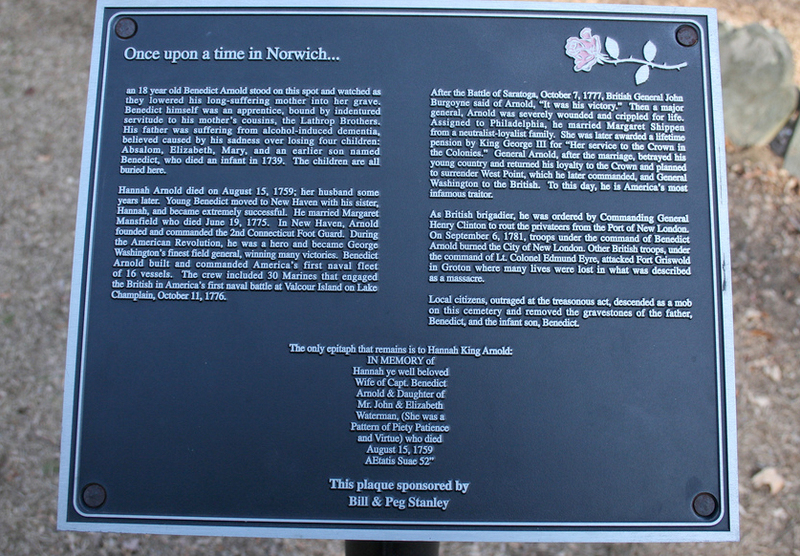 When the news of this reached Norwich, a mob of outraged citizens descended on the Old Norwichtown Burial Ground, and removed the gravestones of Hannah’s husband, Benedict III, and the infant son, Benedict IV. Hannah’s is the only grave still standing with the Arnold name in that cemetery.